Every person’s funeral should be as unique as they are. It should reflect their life, loves, interests, and celebrate their life while respecting their memory. Just as each individual and each funeral is so different to one another, so too does the cost of every funeral vary. Funerals can range from small, family-oriented services, to large-scale church services and everything in between. It’s easy for expenses to add up, but there are ways to keep the price down while still respecting your loved one’s memory. Cremation is usually cheaper than burial. However, we urge you to consider the wishes of the deceased and their family members, as well as their religious convictions, before deciding between a cremation and burial. Cemetery plots can represent the largest expense of a funeral, costing roughly between $2500 and $5000 in city cemeteries. 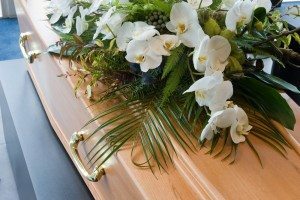 Whether you decide on a burial or cremation, a coffin or casket will be required to transport the deceased. Prices for these items vary greatly depending on the design, ranging from $1000 to over $10,000. The average cost lies around the $2000 mark. Again, the cost of a funeral director varies greatly and the choice of funeral director should be based on the family’s wishes or the deceased’s funeral plan. It’s important for the family to feel supported and understood in this difficult time, so we recommend choosing a funeral director based on the quality of their service and how well they meet your needs. Contact us for a quote. The transportation of the coffin or casket from the service site to the burial or cremation site usually takes place in a hearse. This is included in our funeral directors fees. If the funeral is to be a Cremation then, by law a third party doctor must issue a Permission to Cremate certificate and this can cost around $75. In most cases you will require a Certified Copy of the Death Certificate to deal with estate matters. Currently this costs around $43.50. Flowers, music, banners and other personal touches often add a few hundred dollars to the budget. Costs can be reduced by choosing to bring your own flowers for the service, maybe from your own garden. You can also use pre-recorded music instead of live music, or invite friends or family to perform. You may wish to have a family member officiate at the funeral instead of a minister of religion or a civil celebrant. Pre-arranging your funeral plan allows you to lodge a funeral investment in one of two ways: either in a funeral bond or in a funeral benefit trust fund. Pre-payment of funeral expenses provides peace of mind for your family at a time of great sadness. Many Brisbane funeral directors have funeral plans that allow you to pay in instalments over time – meaning no insurance premiums for you and no funeral expenses for your family. Choosing a suitable funeral plan for your individual needs is as important as choosing the executor of your will. Combine your Funeral Plan with an experienced funeral director like Alex Gow Funerals and you have a partnership that is committed to providing the best possible funeral care. Call Alex Gow Funerals on (07) 3073 4817 to start managing your funeral costs today.